Black Friday Mattress Deals 2018 – Best Prices of the Year! Black Friday and Cyber Monday deals are here! If you need a new bed for the guest room or your mattress is past its prime, this is the time of year that you can get a deal on a new mattress. And, if you want to break it down to payments, most of these mattress brands use Affirm and they have a Black Friday/Cyber Monday special offer too. Use the Affirm app you could get 5.3% APR on purchases up to $10,000. Offer good until Nov. 30th. Note that several mattress brands below offer 0%. Check Black Friday deals on Amazon for the best prices on bed frames, mattress protectors, mattresses, sheets, pillows and more. When you buy a new bed, protect your investment. Get a mattress protector to go on it. Note: Unbox Mattress may earn a commission when you shop through our links. Here’s our list and we’ll update it as we find new deals! Starting now and running through November 23rd. 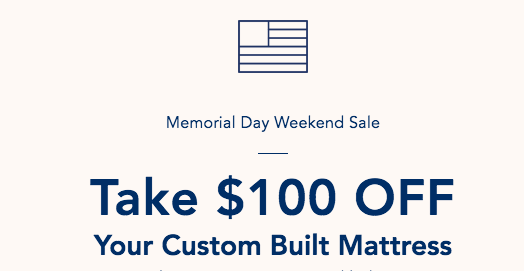 Save $150 instantly, receive up to 2 free pillows ($120 value), 50% copper fabric upgrades (up to $100 value), and 0% financing. This is a total of $370 in savings! Plus, verified military save an additional $50! Offers can not be transferred. Discount must be applied at time of purchase. Use code HOL125 for $125 off orders over $500. Or if over $1200, use code HOL225 to save $225. Bear Mattress will also throw in 2 of their Cloud Pillows for FREE. Premium, high quality mattresses that come shipped to your door. See our review of Bed in a Box Serenity Mattress on YouTube. Discount taken off at checkout. 20% off online mattresses, including all-new Bloom Hybrid & Spartan. Sale ends 11/20/2018 which is actually before Black Friday. We don’t get it either. Offer: 10% off any order with a mattress. See our Casper mattress review video. This is one of the more firm bed in a box mattresses and it’s very well made. Want to learn more? See our Dreamcloud review video on YouTube. Save $200 on a Dreamcloud mattress for Black Friday – or our video has a code to save $200 year round! Nature’s Secret For Deep Comfortable Sleep! 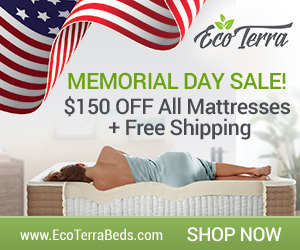 The Eco Terra Mattress has the wonderful feel of luxurious, soothing natural latex, plus the supportive and motion-isolating function of individually wrapped, fabric-encased coils, to provide you with the most comfortable night’s sleep. Get $100 off on any Eight Mattress, plus get a$25 Amazon Gift Card. Discount automatically applied at checkout. Deal ends Wednesday, 11/21. Take $325 off any mattress, you will also receive a $10 Amazon gift card. Use code ‘BLKFRI’ at checkout. Highly customizable hybrid mattresses with many models to choose from. $200 off when you spend $1,750 or more with code HOLIDAY200. Today through Black Friday, 11/23. Latex For Less Mattress is made with the finest quality 100% natural latex, organic cotton and pure natural wool. Certified by GOTS, Oeko-Tex Standard 100 and Eco-Institut. Reversible with 2 firmnesses in 1 mattress, for comfort. BLACK FRIDAY (11/22 to 11/25); CYBER MONDAY (11/26) and CYBER WEEK (11/27 to 12/7). Layla is a memory foam bed that’s soft on one side and more firm on the other – plus it’s copper infused for its antimicrobial properties. + SITEWIDE DEALS Like $30 off the amazing Layla pillow (seriously it’s so comfy, squishy, heavenly). $40 off a topper and more. They say it’s the season for napping and Nectar is a great memory foam mattress for that! Take $125 off any mattress purchase PLUS get two free Nectar pillows ($275 value). The most unique safe, breathable baby mattress. See our Newton Baby Mattress Review. This is Nolah’s BEST Black Friday offers EVER and there are a lot of them. Offers are valid from Thursday 11/15/2018 to Monday 12/03/2018. 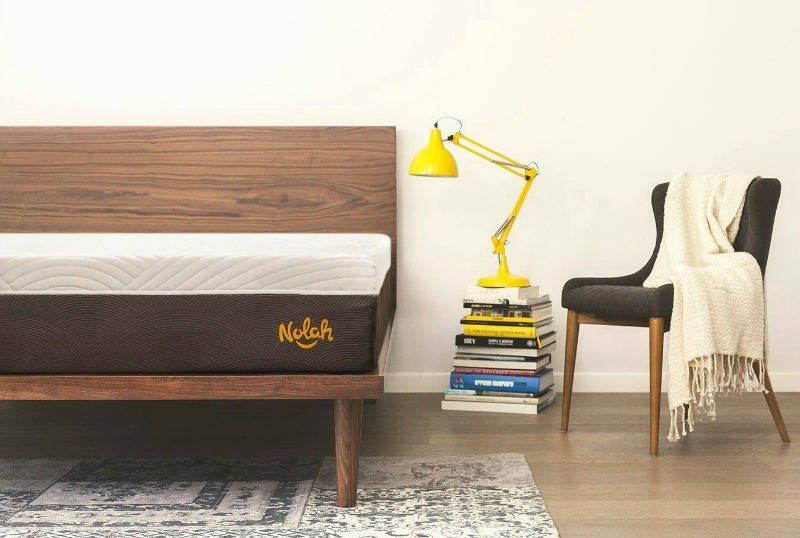 Black Friday Sale – $100 Off a Novosbed Mattress. Promo code SAVE100 will be automatically applied. BOGO sale for Black Friday/Cyber Monday! They are offering buy one, get one pillows with code FOODCOMA. The flexible, comfortable no memory foam bed. Read our Purple mattress review. They recently came out with a cozy blanket (that’s not purple). Get up to $100 off* + a FREE Purple™ Blanket (up to $199 total value). See list of Black Friday deals for Nest Bedding. If you want a latex bed at a great price, SleepEZ is a true factory direct with 41 years of experience. The SleepEZ Black Friday Sale runs from Monday, November 19, 2018 at 7am PST, to Friday, November 23, 2018 at 11:59 PM PST. Promo Code#1: Friday250 to take $250 off any mattress size. Promo Code#2: Friday100+2pillows to take $100 of any mattress size and get 2 free natural Talalay latex pillows. Luxury hybrid mattress that comes in 3 firmness levels (to us the plush is a medium and what we have/love). Use “THANKS150” at Checkout to take $150 off a Voila. There are a lot of sales at Yogabed for Cyber Week, not just on mattresses but on sound machines too! 11/21-11/28- Cyber Week Sale: Save $300 on Yogabed mattresses (King, Queen, CalKing) and $200 on Full, Twin, and TwinXL. 11/28-12/31- SURPRISE Cyber Week Extended Sale: Save $300 on Yogabed mattresses (King, Queen, CalKing) and $200 on Full, Twin, and TwinXL. 11/21-12/3- Cyber Week Sound Sale: Save 20% on all sound machines using the code SLEEPWELL at checkout. 11/29- Flash Sound Sale: Amazon Deal of the Day. For one-day only use the code DONTSNOOZE to get 30% off all sound machines. Value priced already, Zinus is taking up to 30% off products on their entire site, not just mattresses but bed frames, couches and more. A queen 10″ hybrid is only $177.80. If you go to 8 inch it’s $138. They also have a 6 inch bed (great for bunk beds). No promo code needed. Until Nov. 28th. BedJet cooling and warming bed fan is coming out with a newer sleeker model next month, see our new BedJet preview. Sale runs November 19th and run through the end of December. BedJet units will be on sale for $299, and most Cloud Sheets will be discounted as well. Up to 40% OFF Black Friday Sale Now Active – No Promo Code Needed. Go to BedJet.com for offer. Mattress pad that heats or cools your bed to your desired temperature. 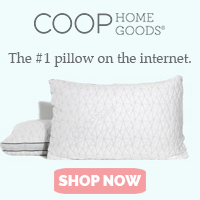 If you want an amazing new pillow or a specialty pillow, Coop is your online store! CYBER MONDAY SPECIAL. On November 26, take 20% off sitewide. Otherwise, use this link to take 15% off until December 17th. Classic brand with real feather pillows. Make a beautiful gift. 30% off select bedding items. See Pacific Coast website for details. Is a sleep product on your Black Friday list? Let us know what you’re pining for in the comments. Do you want to learn where to find a used Purple mattress? Here’s our quick guide to finding one for a great price. Even though they may be in like new condition, they’re sort of like a car. They lose value as soon as they’re out of the box. Note: we may earn a small commission if you shop through our links. You can get a great deal on a used Purple mattress if you know where to look. Avoid shipping and do local pickup or classifieds sites such as eBay and Craigslist. You’ll always find used Purple mattresses there. Just search for your state and city. It’s not hard to find a 2nd hand purple mattress. We prefer eBay because of the rating system. Find your city and state on Craiglist and search in the section for beds. Always ask to see the bed before you buy on Craigslist. Ask if it’s a factory second. Look for any deformities in the polymer (any divots, dips, etc). Ask how long they’ve had it. You can always message us to see if we know of any used Purple mattresses in your area. Adopt a Bed is a Utah charity that sometimes gets Purple mattresses. Call them at 801-266-1288 to see. They’re located at 583 W Billinis Rd #1, South Salt Lake, UT 84115. They also accept returns from Purple and other online brands so you can get a refund. See how Utah mattress donations work. You can score an even better deal on a used bed if you are willing to do a little work and wash the cover that may have some spots or be less than clean. Purple mattresses are easy to clean. Did you know that all Purple mattresses have a removable cover? You can unzip the cover on all Purple beds. Just wash the cover in a regular washing machine (we recommend using a gently cycle and air drying). Use regular detergent and some Borax. Spray any stains or spots with OxyClean white. Always use a mattress protector. We highly recommend purchasing a new Purple mattress protector directly from Purple. You may be able to find one on the sites listed below for less (worth a try). Where Can I Test a Purple Mattress? Alpine, Utah at Purple headquarters. All Purple products are on display and you can try them out. Open every day except Sunday. November 11 is Veterans Day and mattresses, bedding and accessories to help you get the best sleep are on sale for the holiday. Thanks to our veterans for your service to our country. Unbox Mattress salutes you and your family. Veteran’s Day sales are different than Black Friday. Some are better actually (some not as good). So if you don’t see something you want on this list, wait a few weeks and check out our Black Friday mattress sale list. Brooklyn Bedding is giving 30% off sitewide to veterans and is one of our top Veterans Day deals this year. Our second choice is Nest Bedding with $200 off and a free sheet set. Unbox Mattress may earn a commission when you shop through our links. Need a new bed? Here are the best Veterans Day sales. Deal: $320 Veteran’s Day Savings Event! 0% financing available, and free shipping! Offer: Verified military can save $225 on any mattress. Avocado beds are made with natural and organic materials. Discount for all active, reservist, discharged and retired US Army, Navy, Air Force, Marines, and Coast Guard personnel. To apply for verification, visit AvocadoGreenMattress.com/Service-Discounts or request a form using their website chat function. Discount is valid on mattresses only and cannot be combined with other offers. Non-military? Use code 150GREEN for $150 off any mattress. Cannot be combined with other offers; valid through November 18, 2018. 15% off for Military Members. Click here. Offer: 20% off every product. Veterans get 30% off. Yes, that means their amazing shredded memory foam pillow is on sale! Adjustable beds, everything. What an incredible offer! 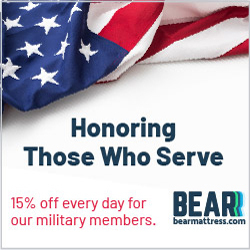 Offer: 10% military discount off any order with a mattress for Active Duty, Retirees, Veterans, Military Spouses, and Military Family Members. Dates: Until Nov 15, 2018. Offer: $300 the Luxi 3-1 Queen and King Size mattress – use code SLEEP300. Or take 20% off ANY PRODUCT with discount code LUXIDEAL. 20% Off for all Veterans, First Responders & their Families. Shop Now! $200 off the Nest Bedding Alexander Signature Hybrid and other models and a FREE sheet set (see site for details). Nest is based in California and employees and family are being affected by the devastating wildfires. Our hearts also go out to them (those who’ve lost homes and loved ones) this Veterans Day. Offer: Click here and use coupon code Veterans225 and save $225 off every mattress. Offer: $150 off luxury hybrid mattress. Available in plush, medium firm or firm. In our opinion the plush is medium, it’s not a super soft mattress. Normally we like medium firm but have a Voila in plush and it’s just right. Use code “Vet150” at checkout. Offer: Take $200 Off Yogabed Mattress and Free Shipping! 0% Financing for as Low as $100 Per Month. Chilipad Cooling mattress pad that heats or cools your bed to your desired temperature. We’ll keep adding the best mattress deals for Veterans day as we find them, so be sure to save this article. Let us know in the comments if you have any questions or find any great deals! Labor Day is the best time of the year to buy a mattress! Many bed in a box mattress beds are on sale with Labor Day discounts. Get killer deals on online mattress brands, pillows, and sheets. Labor Day 2018 is on Monday, September 3rd this year (it’s always the first Monday of September). Most of the beds on this list offer financing – usually 0% so you can get your bed now and pay as you go. Labor Day Sale! $320 Value Offer. Get a huge $150 discount, 50% off copper-ion fabric ($50 value), 2X premium pillows ($60 value each), 0% financing available, and free shipping! 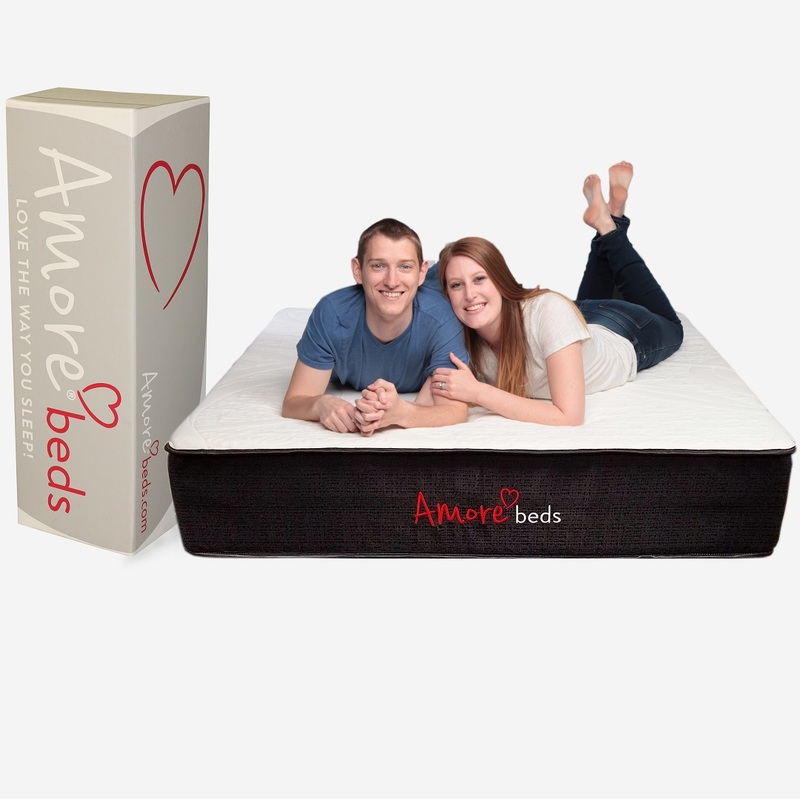 Amore is a 12″ foam / coil hybrid mattress that comes in medium, soft and firm. For an additional $100 you can split the bed so each side has a different level of firmness. Verified Military & Veterans save an additional $50! Or you can get 2 of their awesome pillows free with any mattress purchase. Avocado Green Mattress is made with only natural and organic materials. 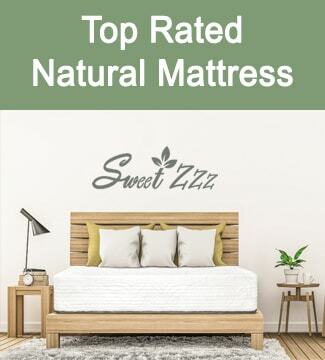 It’s a 100% natural Dunlop latex mattress from tree-tapped and sustainable sources. There are no polyurethane foams to break down. No memory foams to off-gas. No solvent-based adhesives to emit chemical odors. And no chemical flame retardants to endanger your health. An Avocado Green Mattress is honest and natural. Labor Day discount starts Friday, August 24th and runs through Tuesday, September 4th. Bear comes in original and a hybrid model with springs. Save up to $200. Bear Mattress is made with Celliant® technology, clinically proven to promote a more restful sleep, aid in quicker recovery, and help you wake up with more energy. It will never wash or wear out and works right through a protector, sheets and your clothes. Bed in A Box is the original boxed mattress with many years of experience, they manufacture many styles of premium beds. Use coupon LABORDAY5 to get 5% off any mattress + A Free Gift (pillows, sheets or a throw blanket). Not valid on previous purchase. While supplies last. Read our Bed in a Box Mattress Review. Check their site for their bed in a box Labor Day discount. Brooklyn Bedding has been making beds for other brands for years before they came out with their own. That explains why they have such a wide selection of mattresses with different options and accessories. Made in the USA. The Brooklyn Signature is one of their best selling beds. Casper is an award-winning all foam mattress. See our Casper bed review. Take 10% off your order with the purchase of any mattress with code SLUMBER10. Take $200 off your dream mattress. More firm, luxurious, tufted Dreamcloud has a full year trial period. Classic memory foam bed with tech built in and now a customizable feel. Comes with free sleep tracking and coaching. Recently redesigned with more options including levels of firmness, split firmness. Save up to $150. One of the few flippable mattresses that comes in a box. Comes in all foam, spring, latex hybrid and dual firmness options. 14″ thick. Save $325 on IDLE Sleep mattresses! Use code “LABORDAY” at checkout! Layla is a unique flippable (one side is plush and the other side if more firm), copper-infused memory foam mattress. Over 10,000 5★ reviews. The Leesa Mattress is about a 6 out of 10 in regards to firmness and the Sapira Mattress by Leesa is a 7 out of 10. Labor Day Sale! Get $150 Off Any Mattress With Code “LABORDAY”! All foam mattress with a 365 day trial period. Nest Bedding has several mattress stores, but you can bag the savings by ordering online. $150 off coupon code NEST150 Alexander Signature Hybrid. Monthly payments from $69. Free Sheet Set with purchase online. 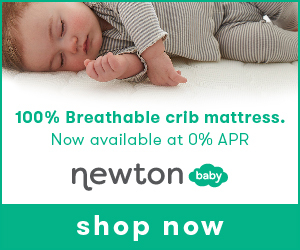 The Newton baby mattress is unique in that it’s breathable. The cover and the inside polymer are specifically engineered to be safe. Also, it’s all washable and the mattress is recyclable too. It’s like your baby is sleeping on a cloud. 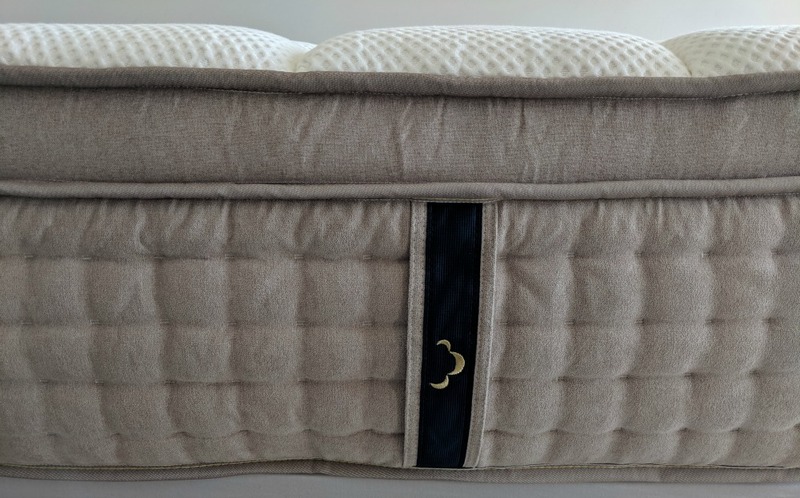 Read our Newton crib mattress review. 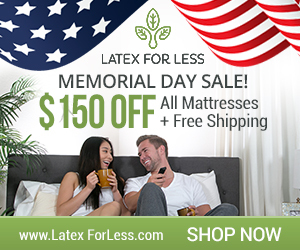 You pay more for a natural latex mattress but you get the savings in how long it lasts. Many styles to choose from. They say a latex mattress will last as long as 3 or 4 average foam mattresses. All mattresses will eventually sag or get imprints but natural latex will take longer to develop them. Purple mattress is unlike any other – it has a comfort grid layer on top to cushion your pressure points. Sleeps cool and has zero memory foam. Read our new Purple bed review here. Labor Day Sale! Get $200 Off a Yogabed Mattress and Free Pillows with purchase. No Coupon Code Required. Yoga bed is a 4-layer gel memory foam bed made in the US and has a 10 year limited warranty. Two free pillows included with each bed (one pillow for twin and twin extra long sizes), making this deal even better. Voila is a top pick, quality mattress that’s ranked high on Consumer Report’s list of hybrid bed in a box mattresses. Use “USA150” at checkout to save $150 off your purchase through Sept. 10th. Hope you liked our Big List of Labor Day Mattress Sales for Online Brands. Oh, and don’t forget Amazon. They have mattress sales too. If you’re looking for the cheapest mattress, look no further than Linenspa. Amazon will price match so if you see a mattress on Amazon you should get the same as the Labor Day price on the brand’s website. Look on Amazon for a mattress here. However, for the price/value and comfort on Amazon, my first choice is this mattress. The 13″ queen is under $300 and it’s highly rated. Watch for a review coming up! Please let me know if we missed any or any requests you might have in the comments. 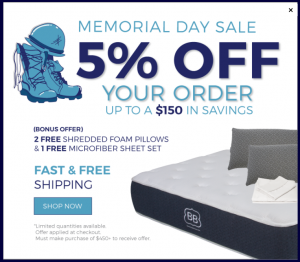 This year’s Purple mattress Memorial Day sale is the best deal we’ve seen from them – ever. If you’re looking for a Purple mattress discount code just know that these deals don’t need a code. Instead of a discount you get FREE product! Instead of coupon codes or reducing the price of their products, Purple gives you free product with a mattress purchase. This Memorial Day weekend they’re giving almost $200 worth of product with purchase. There is no coupon necessary and FREE product will be applied at checkout when purchasing a New or Original Purple Mattress. We earn a small commission on purchases we refer at no cost to you. We’ve been a fan of Purple mattress for longer than any other brand. We try not to be biased because everyone has their own unique and beautiful differences – but we think it’s the best unboxed mattress on the market. Really. It’s what we sleep on and recommend most often to our readers. Purple has the original and the new Purple mattresses, the Purple2, Purple3 and Purple4. The Purple4 has the most dramatic difference and is the thickest of the four styles. They’re all made in the USA. Not sure which mattress to get? Compare Purple mattresses. Best sheets for Purple mattress? Purple sheets! Stretch Armstrong is only slightly stretchier and these sheets are a lot softer!! You can’t get the full benefit of the flexible comfort grid on top of every Purple mattress (that cushion your pressure points) without sheets that are flexible too. Otherwise you get the drum effect when cotton non-stretchy sheets are stretched across your bed. Drums don’t belong in the bedroom! Purple bed sheets come in white, slate, sand and yes, PURPLE! Retail varies by size but a king is $129. Fits the new Purple mattress and the original. A super cushy cushion for your back side and when you can’t lie down on your Purple mattress but need some pain relief. Also amazing for long road trips and jobs that involve a lot of sitting. Or maybe you just drive an old car and the seat cushioning is worn down. People use these for backs and on wheelchairs too. Want to learn more? Check out our Purple4 mattress review. Remember that the Purple mattress is the top mattress only. You do need something to put it on – they don’t recommend box springs. Suggested: the Purple base or if you’re really fancy, the Purple Powerbase.